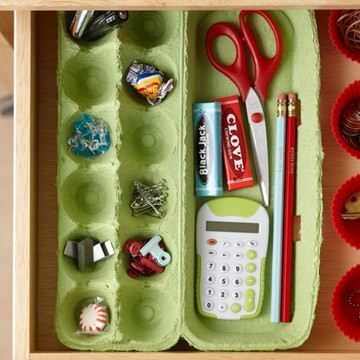 Because I love to organize (Hello, my name is Kat and I’m an organizing maniac) I love egg cartons. They’re just the perfect little thing to organize all kinds of life’s little accoutrements and they come with a lid – just too perfect. 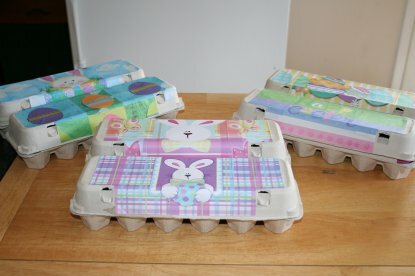 Unfortunately they’re not the prettiest things around so I like to decorate my egg carton organizers. 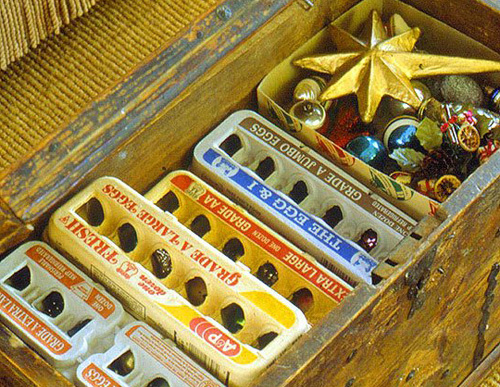 I’m without my camera for the moment so I’ll post some decorated egg cartons I found posted by some very craft (and organized) bloggers. 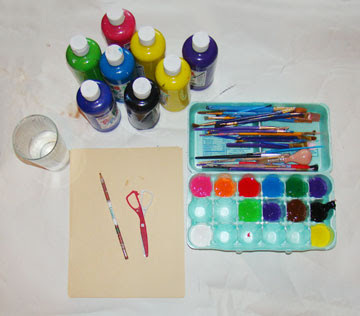 The above pic could just as easily be storing small craft supplies or the supplies for a project you’re working on. This makes it easy to move a craft project to different areas of the home. You can start working on your project while watching your kids in the wading pool, then move it to the family room after dinner without having to spend time gathering up all your small items. The bonus is that the top of the carton, when opened, serves as a work tray. jewelry – I like to keep small gold earrings in one section, small silver earrings in another section, pearl earrings in another section, dressy rings in one section, everyday rings in another section, etc. 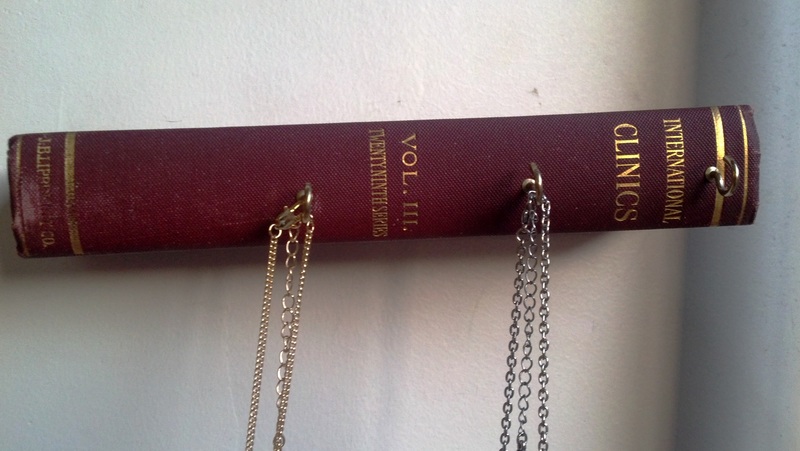 This makes it so much easier to find the jewelry I want when I want it. To get even more mileage out of your carton line the top with Styrofoam and poke lapel pins or earrings through the foam. 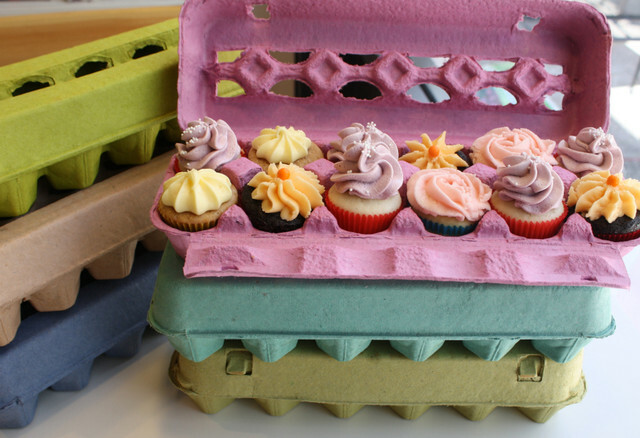 If you have a dozen or more of something and it’s small enough to fit in an egg carton then go for it! My friend G and I were wandering around The Lab (it’s an industrial chic outdoor mall) after lunch at The Gypsy Den and ended up in this little clothing store “Gloss” that had the most creative displays. 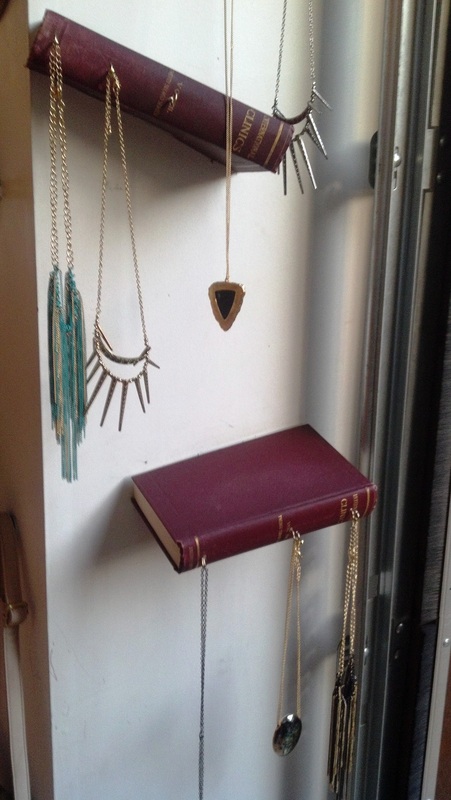 Take a look at their books made into shelves that double as jewelry organizers. This is a dollhouse made from an Ikea bookcase. 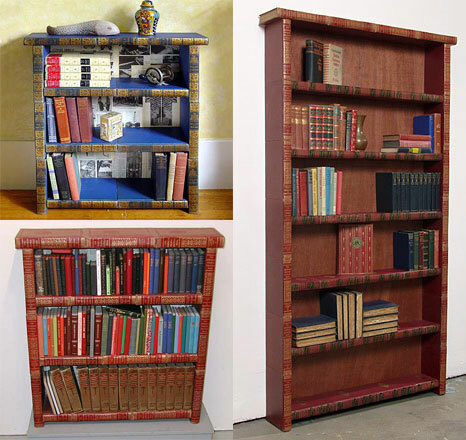 It’s a fantastic way to salvage a bookshelf that you may not have a use for anymore or which is marred in some way that makes it unsightly as a bookcase. 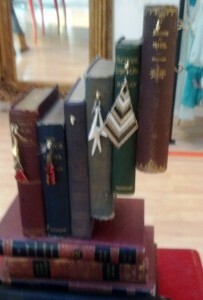 I found this pic while traipsing through Grosgrain Fabulous. It’s worthwhile to click on over there and read her comments and thoughts regarding this dollhouse. 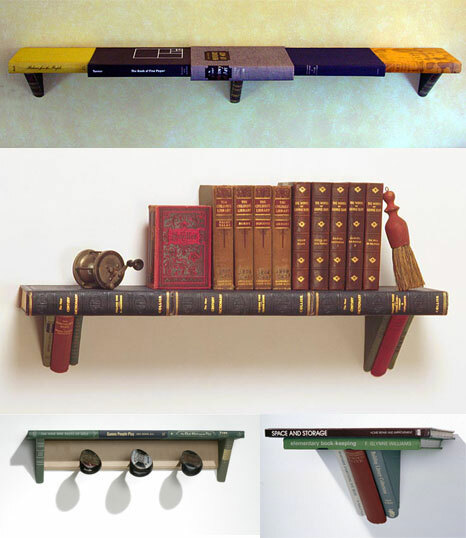 WebUrbanist has put together some wild book shelves which lend themselves to the DIYer with access to a glue gun and a hammer. 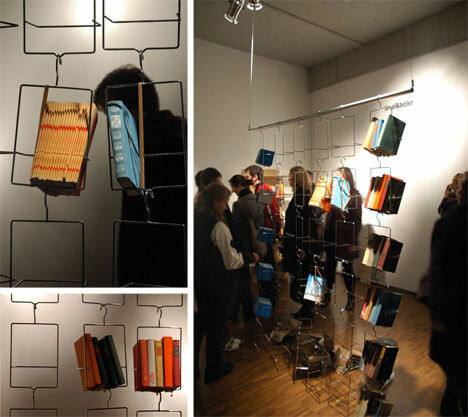 And check out these book cases made from books. I’ll call them Cannibal Cases. 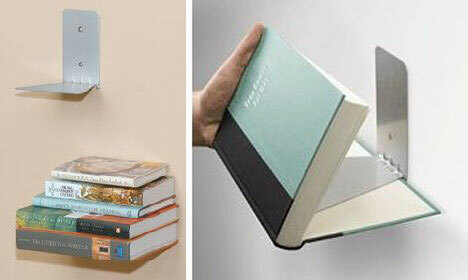 Check out this hanging book case made of – wait for it – HANGERS! You’ll need to incorporate some plier action into your skill set, but it shouldn’t be too difficult. 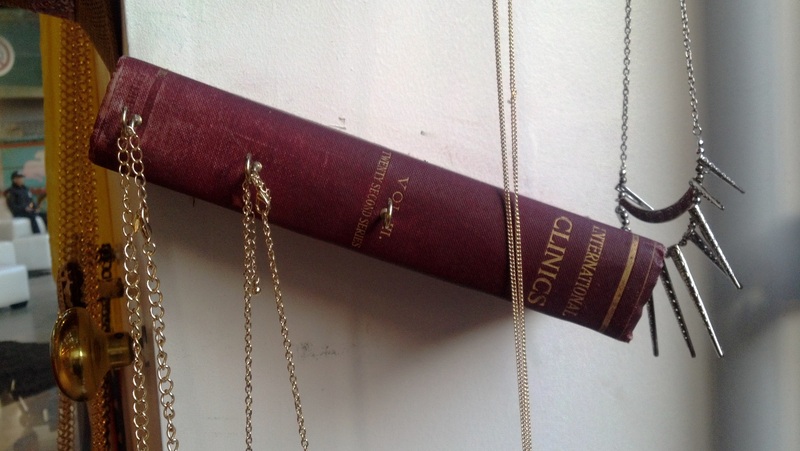 I think this is my favorite simply because it’s so hard to find ways to reuse dry cleaner hangers. 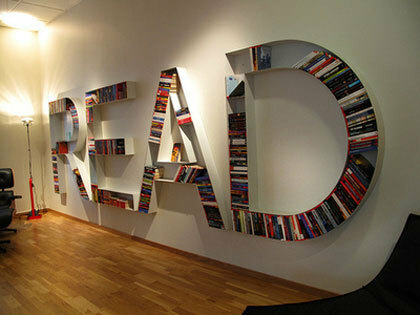 I think this one is made from pallets. 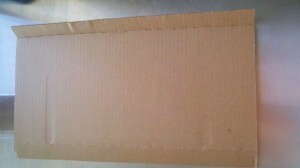 If you have a lot of cardboard boxes around, decoupage them (for beauty and strength). Stack them how you like them and secure with 2 straps. 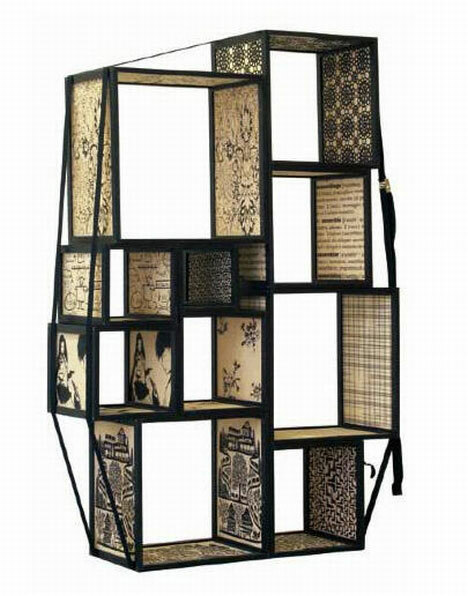 This contraption won’t survive an earthquake or a pair of toddlers, but it could work nicely as a room divider. And this is just for fun. It doesn’t necessarily use recycled materials but it’s too much fun to not pass on to you all. Oh the possibilities! I just cannot bring myself to buy boot trees. 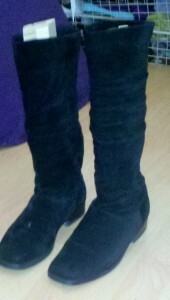 I need them, but my Irish blood won’t let me pay $20 for something that will never leave my closet. But I was tired of my boots toppling over so I made enough boot trees for all of my boots and it didn’t take me longer than 30 minutes to make them all. I used a box cutter to cut a cardboard box into squares that I could fold into thirds and stand up inside each boot. 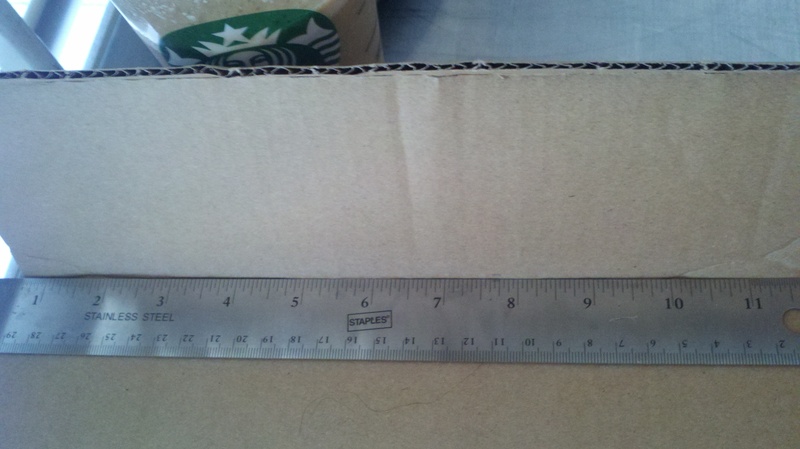 I didn’t measure anything – just eyeballed it. First piece of cardboard cut. There’s already a fold in this piece so I just needed to make two more folds to create a triangular shaped tube. 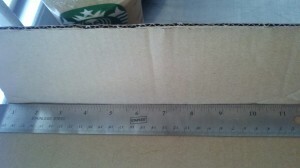 I used a ruler held against the cardboard at the point I wanted to make the fold and then wrapped the cardboard up around the ruler. Using a ruler to create creases. Wrap some shipping tape, masking tape or duct tape around each triangle so that it holds it’s shape inside the boot. Because I don’t like to see the cardboard sticking out of my boots I cut each set of boot trees to just below the top of each boot. I was in the process of changing out my seasonal household items, going from summer to fall, and was on my way to the store to purchase those big plastic bins with lids. I got to looking at them and the cheapest ones were still between $8-$9 each! I considered what I had at home and it occurred to me that I have many pieces of large luggage that are just sitting there empty. Now I still want to use my luggage to travel with but I can certainly pick up used luggage at garage sales and thrift stores to store my seasonal decor in. My only qualm was how to clean the used luggage both inside and out before feeling safe to bring it into my home. Well that will help to clean my luggage but I’m still not confident that it will sanitize it, so back to Google to see what I can come up with. One traveler recommended sanitizing the inside and outside of suitcases with a hand-held steam cleaner. Apparently the heat will be hot enough to kill any bugs and germs. I like that solution. In fact I think I’ll steam my new/old luggage using the vinegar and water solution. I made sure to buy luggage that would fit in with my decor so that I could hide my stored items in plain site. 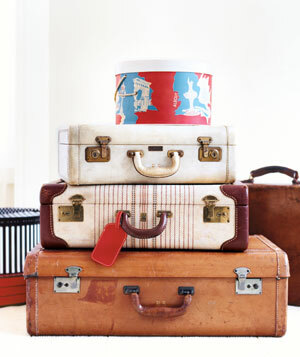 I plan to put all of my winter items inside four suitcases and stack them beside a small sofa to use as an end table. If you don’t want to bother with having to find “pretty” luggage you can always slide them under the bed or stow them in the garage. Storing some of your favorite board games in a piece of luggage makes it easy to take to game night at a friends home. 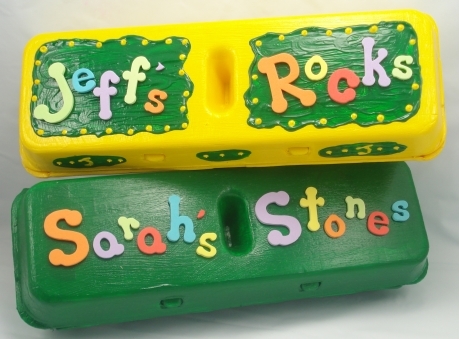 Store children’s toys in one of your luggage pieces. It will fit under the bed and you can grab it and go when needed.